A naked man jumped on to the roof of a double-decker bus from a top-floor flat which had caught fire. The man, who is thought to have been in the shower, leapt 10ft (3m) from a second-storey window above a cafe in Braintree, Essex. Andy Waterman reversed his bus so the man, who was treated for breathing in smoke, could make the jump to safety. "He's got some courage," Mr Waterman said. "But had he not he may not be here today." Police said they were now treating Wednesday's fire as arson. They want to find a man, believed to be aged about 19, who was spotted fleeing the scene. Bus company First Essex said Mr Waterman was driving the out-of-service double-decker back to the depot when a group of people stopped him to ask him to help. "We lined the bus up, close to the building to enable him to jump from the flat roof on to the top of the bus - he had no other exit," Mr Waterman said. "The poor guy was in the shower - he was completely naked. It was freezing cold." Mr Waterman said he moved the bus, with the man still on top, away from the fire. "We waited five minutes or so for the emergency services to turn up," he said. "They lobbed some clothes up to him and eventually got him down from the roof of the bus." Four people were assessed by paramedics at the scene, in High Street, and the man who leapt from the flat was taken to Broomfield Hospital before being discharged. Essex Fire and Rescue's Dave Barritt said: "If the bus hadn't been there we would be having a much more serious and sombre conversation." Image caption Braintree District Council said it would offer assistance to "those affected"
Mr Barritt, the incident commander, said: "It must have been a traumatic experience for him. "It is the ultimate last resort for an escape plan." 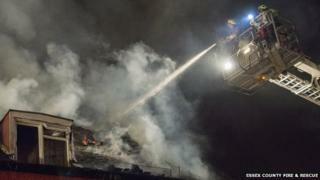 Fire crews took some eight hours to get the fire under control after being called at about 19:30 GMT. The fire service tweeted that Mr Waterman is to get the chief fire officer's commendation for his actions. According to the Braintree Emergency Night Shelter (BENS) website, a homeless hostel with four bedrooms operates from the same building at the cafe. Braintree District Council said it would be "offering appropriate assistance to those affected". A structural engineer is due to assess the damage at the timber-framed building.